Couture Closet-being a "mom bride"
There is nothing lovelier than catching a sweet moment between a mother + her child. When you put the "Mom" topic into a wedding scenario, your mind will go straight to moments between the bride + her mother while the mother of the bride is zipping up the back of her dress. Or a sweet Mother/Daughter embrace before she walks down the aisle. But what about those brides who are Moms on their wedding day? If you are a Mother yourself, then you know that you never get a day off, even if that day is "supposed" to be all about you + your husband to be. Yes, even on your wedding day you still have little humans that are counting on you! Momming is a precious gift, even if it doesn't feel like it sometimes. To be able to be a Mom + a Bride on your wedding day? Well..... We think that is something so so beautiful! Equally as beautiful, is BECOMING a Mom on your wedding day! Saying "I Do" not only to your husband but to an instant family! How amazing is that!!?? Or maybe you are blending your family with your husbands family + now your are a Mom to more children than you started the day with! However you "Mommed" on your wedding day we think it is something truly special! So CHEERS + Happy Mothers Day to all our Mom Brides out there! Y'all are Rockstars + we love you ladies to the moon! And to all our brides that are now Moms, to our own mothers, + to all of the mothers of our beautiful CC Brides, Happy Mothers Day to you too! xoxo, The Couture Closet Gals! These photos by Sarah Babian Photography are just stunning! If it weren't for being a Mom Lindsey would have never met her husband Zachary! These two met at the play place inside Chick-Fil-A. Both of them had a daughter around the same age + the rest is history! Now Lindsey is a Momma of 2 precious little ladies! These are just stunning photos of a family Elopement to Yosemite National Park. Erin has a son + so does her husband, Hunter. Just the 4 of them set off on a National Park adventure to become a family of four! ALLLLLLL the heart melts for these guys! And you all, the pictures of her little dude zipping up her dress is just the sweetest thing we think we have ever seen! Photography by Erin + Geoffery. This lady is just the sweetest! Here is Amber helping her sweet daughters get ready before she gets dressed herself. The last shot is just so precious! Even though you may still want to party the night away, little heads get sleepy + just want their Mommy to snuggle with them. So glad Amber took a moment to do just that, if only to get this perfect wedding day memory. This beautiful Mom Bride has a son, her husband has a daughter. The bride + groom didn't want to see each other before the wedding so they each chose to do a "first look" with their kids. Shauna helped her new daughter get ready + her son went with her groom to get ready. When everyone was dolled up, Daddy + Daughter had a private moment, then Mother + Son did as well. They all met at the altar to become a family of 4 together! Photography by Jordan Bibb Photography. Amanda spent time to her soon to be daughter while she got ready for her big day. Helping her get dressed and put on some lipstick. Then Amanda gave her a sweet little necklace and a letter that promised to love her like her own. 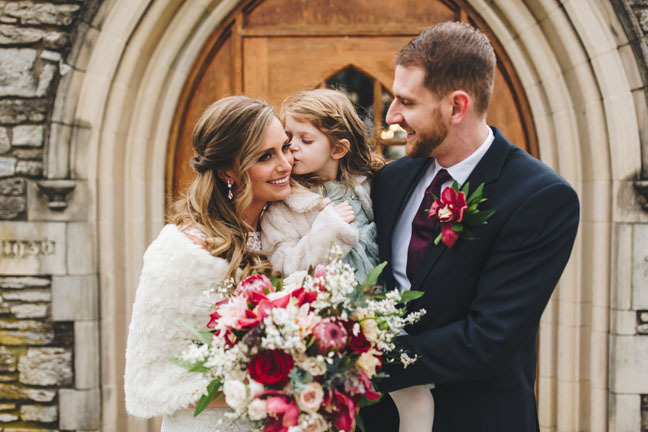 Bride, Groom, and Daughter became a family of 3 + Amanda became a Mom right then + there! Photography by Whitney Knutson.